Bako, Kinabatangan River, Danum and more! 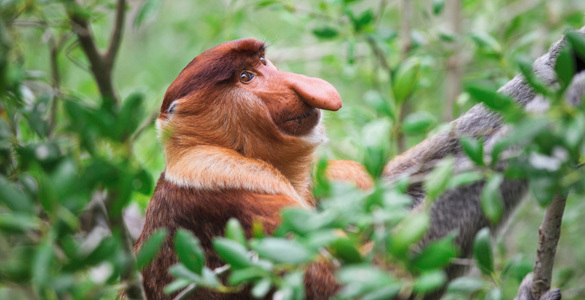 If you plan to travel to Borneo to watch Proboscis Monkeys and discover the jungle life consider to JOIN this amazing Tour designed by Kristina. You will never forget this beautiful adventure! Upon arrival at Kuching International Airport, (preferably before 13:00) meet and greet by our friendly representative and proceed for KUCHING CITY TOUR. Kuching, the Capital of Sarawak, is a cosmopolitan city and this is reflected in the faces on the street. It’s city centre is well preserved with ornate Chinese Temples, The Astana, City Tower, many fine examples of colonial-style architecture, a beautiful waterfront and a number of interesting museums, including the famous Sarawak Museum & Cat Museum. Other places of interest include the famous landmark of the City, the Cat Monument, Main Bazaar, China Town, Old State Mosque & etc. Kuching is a good destination to shop for souvenir such as woodcarvings, “Pua Kumbu” with native design, Pepper products and Sarawak pottery. Sarawak Handicraft Factory and Bird’s Nest are also one of the famous souvenirs which can be found in Kuching. After tour, transfer to City Hotel for check in and overnight. Breakfast at the hotel, morning check out from the hotel and proceed for BAKO NATIONAL PARK TOUR. Bako National Park, established since 1957, is the oldest and one of the most popular national parks in Sarawak. Situated about 37 km from Kuching City, the excursion takes about one and a halfhour by land and boat. With an area about 2,728 hectares, it offers the perfect introduction to Sarawak’s forest and wildlife. Unlike the other parks, visitors to Bako National Park are almost guaranteed to see wildlife such as long-tailed macaques, squirrels, white bearded pigs, silver leaf monkeys, etc. With 17 trails provided, ranging from 0.2 km to 5.75 km, you will almost find new experience in each different trail. You will be brought along the Teluk Paku trail. 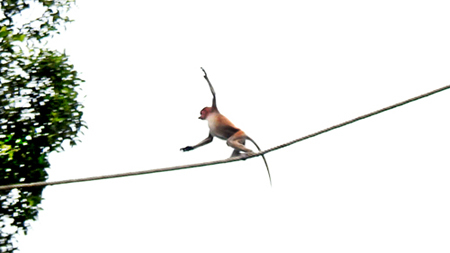 To spot the Proboscis Monkeys you will need to walk slowly, keep as quiet as possible, and listen out for sounds and movement along the way. In Bako National Park, you will also be able to view 7 different types of vegetations and forests from almost desert-like scrub or ‘padang’ to lowland dipterocarp forest. Take the trail to Teluk Pandan Kecil and you will find a lot of the carnivorous plants, pitcher plants, and you will also see the most famous rock formation at the end of the same trail. Lunch & Dinner is provided. 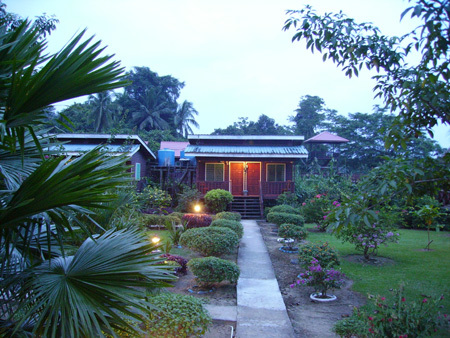 Check in and overnight at the Bako National Park’s Resthouse. After breakfast at the Park Canteen, continue for jungle trekking to explore others flora & fauna. Lunch is provided. Later afternoon, check out from the rest house and take a boat ride back to Bako Jetty. Transfer to Kuching International Airport for short flight to Kota Kinabalu. Arrive at Kota Kinabalu, meet at the airport and transfer to Hyatt Hotel. Free time at leisure. Overnight stay at Hyatt. Meet at Hyatt Hotel lobby and proceed for Safari River Cruise. The journey takes about 2 hours drive heading towards Beaufort through scenic countryside. Your safari begins by using a long boat cruising through swamp and mangrove trees which found abundant along the river bank. 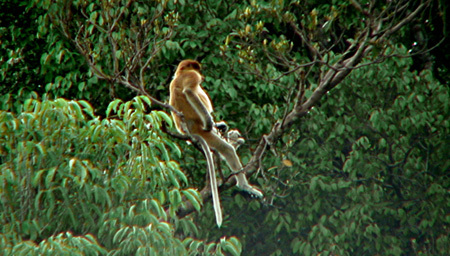 Catch sight of the long nose Proboscis monkey, featuring thick brown fur, white long tail and huge belly that make them look pregnant although they are obviously male. See other animal such as water buffaloes, long tailed macaques, egrets and many more. After dinner transfer back to Kota Kinabalu. Overnight stay at Hyatt Hotel. Meet at Hyatt Hotel lobby and proceed to Beach Bums jetty. Boat ride to Gaya Island, the largest of five island of Tunku Abdul Rahman Park, the island covers 3,665 acres of primary jungle of which a small percentage consist of mangrove. A 1.95 trek through the virgin landscape takes you on a jungle trail and boardwalk through the swamps. You might be lucky to spot hornbills, wild boar, lizards and monkeys. Your guide will explain to you about the flora and fauna of this tropical island. After your jungle walk, transfer to the island of Sapi. Lunch at Sapi and free at leisure. At 16:30 transfer back to the mainland and proceed to the Hotel. Overnight stay at Hyatt Hotel. Early in the morning, transfer to Kota Kinabalu airport for a short flight to Sandakan. Arrive at Sandakn, meet our representative, Drive for approximately 30 minutes to Sepilok Orang Utan Rehabilitation Center. Proceed to the free roaming area feeding platform. 1000 hrs Feeding of Orang Utans. At this center, observe man’s closest relative “the Orang Utan” being rehabilitated to become wild in their natural habitat and experience a walk in the Tropical Lowland Dipterocarp Forest of Borneo. 1100 hrs depart Sepilok and transfer to jetty in Sandakan. 1145 hrs take an hour boat cruise up to the Lower Kinabatangan River Sanctuary where you will take your lunch at Abai Jungle Restaurant. This is a wonderful journey of discovery which starts from the waters of Sulu Sea of Sandakan Town through a magnificent scenery of the Mangrove Forest. After lunch, cruise up river to Sukau village in search of primates especially the Endemic Proboscis Monkeys, birds and other wildlife. Arrive Sukau, check in at Kinabatangan Riverside Lodge. 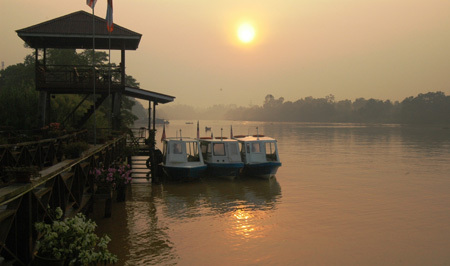 Late afternoon, an option to take another river cruise to Menanggul River, a small tributary of the Kinabatangan. Return lodge for dinner and overnight at Kinabatangan Riverside Lodge. Wake up by the calls of gibbons and hornbills. Early AM, take a river trip to the Ox Bow Lake to observe wildlife and experience the early morning river ambience of the longest river of Sabah. Return lodge for breakfast then free at own leisure. After lunch, late afternoon, another river cruise to search for more wildlife. Dinner and overnight at Kinabatangan Riverside Lodge. After breakfast, visit of Gomantong Caves. Proceed to Danum Valley. An exotic welcome drink will be served while the front office personnel will brief you on the facilities available at the lodge. Lunch at the lodge. 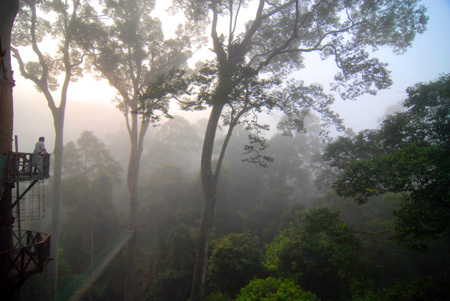 Enjoy the experience of Canopy Walkway. Dinner at lodge. Briefing and slide presentation at the conference room. Night drive in open jeep in search of nocturnal animals (if weather permit). Overnight in Lodge. Breakfast at Lodge, guided jungle activities, trek to the Kadazandusun burial site “Coffin Cliff” then proceed with trekking on the view point for a bird’s eye view of the area. Descend to the Jacuzzi pool for a refreshing dip. Dinner at lodge. Night walk in search of nocturnal animals (if the weather permits). Overnight at Lodge. After breakfast, guided morning walk at the Segama Trail / Hornbill Trail. Lunch at the Lodge. Check out. Depart for a 2 1/2 hours journey back to Lahad Datu airport. Inclusive: Transfers in seat in coach basis, one night at Hilton Kuching or equivalent, one night Bako National Park Resthouse, 03 nights at Hyatt Hotel or equivalent, 02 nights at Kinabatangan Riverside Lodge, 02 nights at Borneo Nature Lodge meals as indicated above, English speaking guide, entrance fees.